While Mega-Catch™ Traps need no Carbon Dioxide (CO2) to attract mosquitoes and other biting insects, Mega-Catch™ does offer its own CO2 gas attractant system for increased capture rates. The PRO 900 ULTRA Mosquito Trap comes CO2 ready with Mega-Catch's™ patented 'Variable Quantity Slow CO2 Gas Release System'. The PRO 900 PREMIER XC can be made CO2 capable with the addition of a CO2 Gas Upgrade Kit (sold separately) which converts or 'transforms' the trap to top-of-the-line ULTRA specifications. Use of this system is entirely optional i.e. while the system is designed to increase capture rates it is not essential to the effective operation of the Traps. 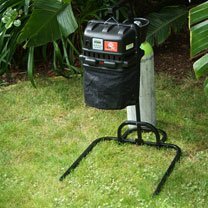 Even without the system, or with the system turned off, the Traps will catch significant numbers of mosquitoes and other biting insects. Operation of the optional CO2 Gas Attractant System enables the Traps to replicate a key feature of human/animal respiration by releasing small quantities of CO2 into the air plume emanating from the base of the trap. Safe and natural, pure CO2 is used extensively in the beverage industry to carbonate (put bubbles into) the likes of beers, sodas and sparkling mineral waters. It is also used in hospitals as an additive to oxygen for medical use as a respiration stimulant. CO2 is readily available and can be purchased from hundreds of gas supply outlets throughout North America (and the rest of world) like Praxair, Air Products, and BOC Gases. We recommend you buy CO2 in 20lb (9kg) cylinders which are available from your local CO2 gas supplier (see our CO2 Gas suppliers page for further details). The quantities of CO2 released can be adjusted between 5 gas settings and also programmed to only release CO2 at certain times of the day. A 20lb (9kg) cylinder used on the recommended setting should last for up to 4 months. Customers often want to buy a gas pressure gauge for their CO2 Cylinder. Checking when your CO2 cylinder is empty can be difficult as the problem here is that the CO2 in the cylinder is compressed into a liquid with only the vapour pressure being measured by a gas pressure gauge. The gas pressure in the cylinder remains pretty much the same even when there is only a small amount of liquid CO2 left in the cylinder. In other words, the gas pressure does not fall linearly with the liquid CO2 level. As the remaining vapor is fully consumed, the pressure shown on the gauge will drop off very rapidly. This means that the cylinder gauge may read 900 psi until almost all the liquid CO2 has gone. That confuses a lot of people who check the gauge one day only to find that the next day the cylinder is empty.This is why we tell customers not to bother buying a gas pressure gauge for their CO2 cylinders. Actually, the best way to monitor the contents of the cylinder is by weight. Weigh the cylinder full then subtract the cylinder's tare (empty) weight, which is usually shown on the outside of the cylinder. The difference between the two is the weight of liquid CO2 in the cylinder. Thus when this difference has reduced by 50% then 50% of the CO2 has been used. The Mega-Catch™ Trolley (including cylinder cover) is an optional extra. 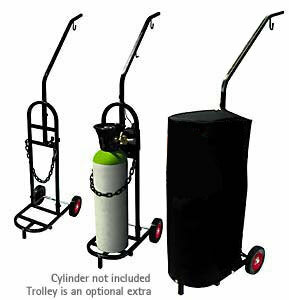 The Trolley can be used to transport and hold a CO2 gas cylinder. The ULTRA Trap should NEVER be operated indoors when the CO2 gas release system is in use. For more information on the CO2 Gas Release System please see our CO2 Gas System FAQ's page. And for more detailed information on how to maintain and care for your CO2 cylinder, download our CO2 Cylinder Care and Maintenance guide.